It was a warm and sunny day, that trip to Target started out wonderful. I was full of hope and my children seemed to be in good spirits. We arrived at the big target sign, pulled into the parking lot, walked into the store, but not before my son had to touch both of the giant red balls in front, wiped the cart down (because I’m that Mom) and headed to the dollar section. So many things, all new, shiny and one dollar! Within five minutes I found about fifteen wonderful things I wanted, then placed half back. We then proceeded to get the “things we came for” and that is when it all went down hill. 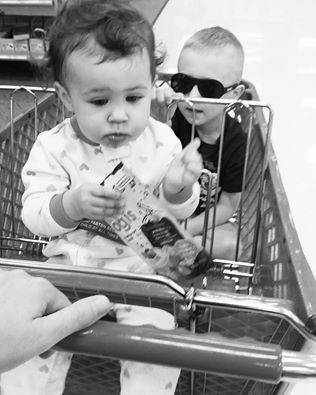 Snacks were always the way to make things better, Katia then looked right at my face and threw her entire rice cereal container all over the shoe isle, I frantically picked up as much as I could. Then Max though it was funny to mimic her so that he could watch me pick up more food off of the floor. I asked Maxwell “Why did you do that?” He replied “Because, it is funnny HAHAHA!” In that moment I just felt frustration boiling, now I have about ten things in my cart and ten minutes into the shopping trip is when things became intense. “Katia please sit down” as she jumps out screaming mad, all while Max sat in the back part of the cart because he refused to walk anymore. Now Katia was pushing on Maxwell’s head to stand up as I’m trying to hold her back down, of course Max screamed and slapped her to stop touching his head. As I asked Max to stop slapping Katia and Katia to stop jumping from the cart, I took a deep breath and smiled at all the people staring at my insane children as they passed. Then two minutes after battling Katia to sit down she started throwing everything from the cart, Maxwell again laughing, me picking the stuff up off the floor. Before I could reach the cart she threw another item her brother passed her, both laughing. Now they start hitting and fighting, screaming again because Maxwell stopped passing her stuff, she wanted more. They were screaming so loud my ears were ringing, but hey people judging, QUIT IT! I’m a great Mom, but I’m not super human, my children do not come out perfect, they have to be taught how to behave, and this day was one day they learned their lesson. That lesson didn’t come in front of every one at Target, since I for the first time in Mommy hood waved my white flag and walked out of Target fifteen minutes after arriving. I could not contain my children or the items in my cart, so it was time to go. My son didn’t get to touch the red balls on his way out of Target (bigger punishment than you think). They didn’t get their dollar presents, we went home where we didn’t turn on the t.v. like they wanted and instead cleaned up the house. I just felt defeated, as I pulled in the drive my husband was so busy working he didn’t realize my trip to Target was much shorter then usual. When I asked him “Hey, you realize I’m back kinda early? !” it then dawned on him, “Ya I’ll tell you all about that one over a glass of wine tonight!” I went in the house feeling empty, all those things at the dollar section were so cute, all I could think about was I hope they are there next time I go back. Maxwell asked me if he could go to the park when we returned, I told him not right now I’m very upset about your behavior at Target today. He replied, oh he replied…”I’m going to do whatever ME want, and drive to the park down the street on my A.T.V. !” Yup, today I was defeated! I just laughed at him and walked away. I gave up on being a “good” Mom in that moment, because I was either going to laugh and walk away or completely lose it. I think as parents we have all been there; crazy moments of having little ones. The most important thing to take from reading this is that it’s o.k. to laugh at the madness. What is not o.k. is to lose your cool, just walk away. To the people watching our children act like crazy apes, remember they are still learning how to behave. Help teach them with your reactions, I’ll even give a few suggestions… Walk by and smile at me, offer support, for example; I’m on the ground picking that food up (I may not need your help,) but if my children see a stranger acting kind and helping me it may make them think twice about their behavior. It may later show in their actions because children do mimic everything. As the parent with the children going nuts, please show me kindness and no judgement. Like our mother’s always said, “If you have nothing nice to say, say nothing at all” That includes your eyeballs, no rolling them as you walk by, because my children’s screams annoy you. Let’s all allow this Mama to wave her white flag, go home, get her kids to bed and contemplate how many glasses of wine she deserves for breaking a (I’m positive) world record of the shortest Target trip ever!